Where spirituality, politics, and pop culture collide! I’ve always liked Goldie Hawn. When I was younger I watched her on “Rowan & Martin’s Laugh-In”, “Private Benjamin”, “Protocol” (No, dear, I’m not a chicken; I’m an emu. ), “Wildcats”, “Death Becomes Her”, and “First Wives Club”. I like that her and Kurt Russell are still together after all these years. I’m not saying I’m an expert on all things “Goldie”, I’m just saying it came as quite a surprise to find out that she’s kind of a well-known figure in the mindfulness movement. It turns out that Goldie Hawn is an author! She has written an autobiography, “A Lotus Grows in the Mud”, and “10 Mindful Minutes”. Both books ended up on New York Time’s bestselling author’s list! This was all news to me when I was approached to review “10 Mindful Minutes: A Journal”. As you may already have guessed, I never read “10 Mindful Minutes”, so the good news is the journal is effective whether you’ve read the previous book or not. 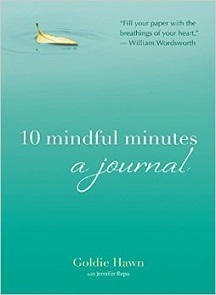 No more talk about the past then, let’s focus on the here and now and “10 Mindful Minutes: A Journal”. Goldie Hawn at a book event. The Journal is authored by Goldie Hawn with Jennifer Repo. I’m not sure how much of whose voice we’re hearing when reading the entries but there is a welcoming warmth in the tone of the writing. The book isn’t focusing on deep, obscure meditation practices. You’re reminded of the basics: sitting comfortably and focusing on your breath. The chapters are divided into specific areas of reflection, such as Discovering Empathy, Transforming Anger, and Cultivating Optimism. In the sections you’ll find meditation exercises, and most important to the book, space to journal your reflections after you finish them. “10 Mindful Minutes: A Journal” works at guiding readers towards a daily reflective meditation practice so that after all the pages are filled, hopefully the practice still remains.